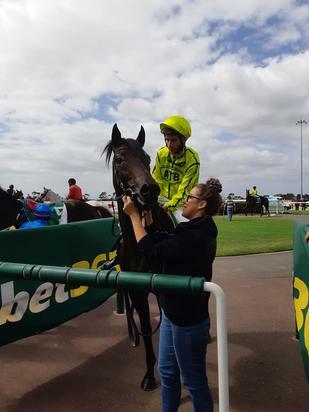 Everything looked spot on for the promising Lord Lennox at Geelong on Tuesday... a suitable rise in distance, a good barrier, the in-form Jamie Mott aboard. And so the four-year-old import was sent out an odds-on favourite, justifying his short quote with a soft and most impressive 4 1/2 length victory at just his third Australian outing. In the placings on three occasions in France, the handsome Lord Lennox joined the stable late last year and has thrived, at each of his local runs showing improvement with the ease of his success suggesting that there are better things to come. "There did not look to be much pace on paper," Mott reported, noting that he thought he may have had to been outside the leader. Instead a few did go forward, enabling Lord Lennox to enjoy a nice run mid-field with cover - and he was always travelling well. "I was quite pleased when there was nice speed on," Mott continued... "he got into a great rhythm and it was just a matter of getting a bit of room. Once he did he went through his gears really nicely." "He travelled a little strongly at his first Australian run but at his last two he has really relaxed and he was crying out for this distance." "It was a good race for him to get his confidence up in and hopefully there is a nice 2000m race for him somewhere in two or three weeks." The stable's Reid Balfour enjoyed the race - "as soon as Jamie got him into the clear I was pretty confident," he said. "It was a nice win and he will continue to improve. He has not been in the country all that long and everyone says that the imports can take 12 months to really acclimatize - so the sign are goo good so far." Still an entire, Lord Lennox can, Balfour said "be a bit boisterous. But so long as we keep him away from the fillies he is easy to handle, he has a good attitude." Racing in the fluoroescent yellow colours of Australian Thoroughbred Bloodstock, Lord Lennox has a large group of owners who have plenty to look forward to. Bred in Germany, Lord Lennox is a son of the multiple Gr. 1 winning Monsun stallion Maxios. His dam is the placed Rainbow Quest mare La Reine Noir, half-sister to the French Gr.1 winner Lady Marian (dam of Gr.2 galloper Loxley) and the German Gr.3 winner Lucidor. Lord Lennox's pedigree brings together Germany's two major influences of recent times - his grandsire Monsun and his close relation Lomitas, Gr.1 winning sire of 48 stakes winners including the star filly Danedream.